Poll: Who do you think will win the World Tour Grand Finals 2018? 2. this time, although we sent strong army, but they are not in good form(or good state). many players just rematch their new coach yet. media have notice it. Xuxin coached by ChenQi, ZhuYuLin coached by QiuYiKe, LSW by MaLin. the first reform after LGL's return is the new matching systerm. LGL told the reporter he did as a intermediary between players and coaches. both sides choose each other. LGL" the player put forward the coach he/she want to me, and then I talk to the coach,see if he/she has the willing and ability to work with the player. and if ok, then let them to cooperate." Does that mean.. ZYL chose Qiu over Li Sun? not sure for now... still matching , haven't published yet. actually, CNT began tring last station, austria open. 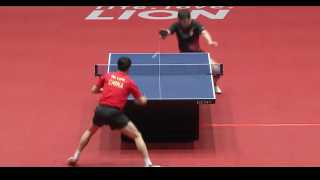 Some slowmotion impressions from Harimoto, 1440p quality! w w w. buyrealdocuments.cc - We are producers and quality sellers of real and fake documents. We process and produce documents that you can use to travel and work in any part of the world. Our real documents are valid and registered in the required government database system. As for our fake documents they look 100% real and can also be use for travel but that is done at the clients risk. We advice clients who want to use thei documents for travel to always go in for the real documents. Visit our renewed website: w w w. buyrealdocuments.cc w w w. buyrealdocuments.cc e-mail: support(a)buyrealdocuments.cc Registered passport of all countries, visas, biometric passport, degrees, drivers license, ID cards, training certificates, M GCSE, A-levels, Social security card, Canada Cards, United States Cards, Student Cards, International Cards, Private Cards, Adoption Certificates, Baptism Certificates, Birth Certificates, Birth Certificates, Divorce Certificates, Marriage Certificates, Custom Certificates High School Diplomas, G.E.D. Diplomas, Home School Diplomas, College Degrees, University Degrees, Trade Skill Certificates, Validate SSN Number US green cards, Counterfeit dollars/euro, Spy Products, Voice Changers Listening Devices, Invisible Ink, DMV Record Inquiry, buy registered and unregistered ID cards,buy registered and unregistered drivers license worldwide, buy registered and unregistered USA(United States) passports, buy registered and unregistered Australian passports, buy registered and unregistered Belgium passports, purchase registered and unregistered Brazilian(Brazil) passports, buy registered and unregistered Canadian(Canada) passports, buy registered and unregistered Finnish(Finland) passports, buy registered and unregistered French(France) passports, buy registered and unregistered German(Germany) passports, get registered and unregistered Dutch(Netherlands/Holland) passports, buy registered and unregistered Israel passports, buy registered and unregistered UK(United Kingdom) passports, buy registered and unregistered Spanish(Spain) passports, buy registered and unregistered Mexican(Mexico) passports, buy registered and unregistered South African passports, order registered and unregistered Australian driver licenses, buy registered and unregistered Canadian driver licenses, buy registered and unregistered Dutch(Netherlands/Holland) driving licenses, buy registered and unregistered German(Germany) driving licenses, where to get registered and unregistered UK(United Kingdom) driving licenses, sale registered and unregistered Diplomatic passports, GMAT, MCAT, and LSAT Examination Certificates , Novelty Birth, Marriage, Novelty Passports and New Identity Packages , Replicated, False Degrees/Diplomas from most post-secondary institutions from around the world. We are the world best producers documents. Hit us and get all your documents problems solved today. We are flexible and very easy to deal with, we accept nearly all forms of payments and all our clients can use any that best suites them. Visit our renewed website: w w w. buyrealdocuments.cc w w w. buyrealdocuments.cc e-mail: support(a)buyrealdocuments.cc --- Keywords: We produce both Real and Real documents. Buy Registered and unregistered USA(United States) passports, Buy Registered and unregistered Australian passports, Buy Registered and unregistered Belgium passports, Buy Registered and unregistered Brazilian(Brazil) passports, Buy Registered and unregistered Canadian(Canada) passports, Buy Registered and unregistered Finnish(Finland) passports, Buy Registered and unregistered French(France) passports, Buy Registered and unregistered German(Germany) passports, Buy Registered and unregistered Dutch(Netherland/Holland) passports, Buy Registered and unregistered Israel passports, Buy Registered and unregistered UK(United Kingdom) passports, Buy Registered and unregistered Spanish(Spain) passports, Buy Registered and unregistered Mexican(Mexico) passports, Buy Registered and unregistered South African passports, Buy Registered and unregistered Australian driver licenses, Buy Registered and unregistered Canadian driver licenses, Buy Registered and unregistered French(France) driver licenses, Buy Registered and unregistered Dutch(Netherland/Holland) driving licenses, Buy Registered and unregistered German(Germany) driving licenses, Buy Registered and unregistered UK(United Kingdom) driving licenses, Buy Registered and unregistered Diplomatic passports, Buy Registered and unregistered USA(United States) passports, Buy Registered and unregistered Australian passports, Buy Registered and unregistered Belgium passports, Buy Registered and unregistered Brazilian(Brazil) passports, Buy Registered and unregistered Canadian(Canada) passports, Buy Registered and unregistered Finnish(Finland) passports, Buy Registered and unregistered French(France) passports, Buy Registered and unregistered German(Germany) passports, Buy Registered and unregistered Dutch(Netherland/Holland) passports, Buy Registered and unregistered Israel passports, Buy Registered and unregistered UK(United Kingdom) passports, Buy Registered and unregistered Spanish(Spain) passports, Buy Registered and unregistered Mexican(Mexico) passports, Buy Registered and unregistered South African passports, Buy Registered and unregistered Australian driver licenses, Buy Registered and unregistered Canadian driver licenses, Buy Registered and unregistered French(France) driver licenses, Buy Registered and unregistered Dutch(Netherland/Holland) driving licenses, Buy Registered and unregistered German(Germany) driving licenses, Buy Registered and unregistered UK(United Kingdom) driving licenses, Buy Registered and unregistered Diplomatic passports, Registered and unregistered Camouflage passports, Registered and unregistered passport Duplicates, Registered and unregistered USA(united States) passports for sale, Registered and unregistered Australian passports for sell, Registered and unregistered Belgium passports for sell, Registered and unregistered Brazilian(Brazil) passports for sell, Id card and Driver's License, buy Real passports, get Real passports online, real passports for sale, Real schengen visas for sale, Real German passports for sale, purchase Real passports online, where to buy Real passport online, Real Canadian passport for sale, Real, passport, id cards, uk, sell, online, canadian, british, sale, novelty, conterfeit, bogus, american, united, states, usa, us, italian, malaysian, australian, documents, idetity, idetification, driver, license, licence, driving, residence, permit, SSN Real passport id, free Real passport, identity theft, Real, novelty, camoflauge, passport, anonymous, private, safe, travel, anti terrorism, international, offshore, banking, id, driver, drivers, license, instant, online, for sale, REAL BRITISH PASSPORT, REAL CANADIAN PASSPORT, REAL FRENCH PASSPORT, REAL AMERICAN PASSPORT, REAL RUSSIAN PASSPORT, REAL JAPANESES PASSPORT, REAL CHINESE PASSPORT, AND REAL PASSPORT FOR COUNTRIES IN THE EUROPEAN UNION, REAL DRIVERS LICENSE,I.D CARDS,BIRTH CERTIFICATES,DIPLOMATS,MARRIAGE CERTIFICATES,AND VISAS, REGISTERED AND UNREGISTERED BRITISH PASSPORT, REGISTERED AND UNREGISTERED CANADIAN PASSPORT, REGISTERED AND UNREGISTERED FRENCH PASSPORT, REGISTERED AND UNREGISTERED AMERICAN PASSPORT, REGISTERED AND UNREGISTERED RUSSIAN PASSPORT, REGISTERED AND UNREGISTERED JAPANESES PASSPORT, REGISTERED AND UNREGISTERED CHINESE PASSPORT,REGISTERED AND UNREGISTERED PASSPORT FOR COUNTRIES IN THE EUROPEAN UNION. The idea that Cheng Yinghua and Larry Hodges are questionable sources is not something I can accept. They are both USATT Hall of famers and Cheng was a practice partner for China's penholders in the 80s and a strong world class player even well after his prime. So the word "clone" is what offends you, not the substance of what was said. Good. So let's get back to serious TT, and stop making others sound like idiots because they are not saying it how we think they should say it. Cloning rivals has always meant that you play like the rival in practice and you are a practice partner who studies what the rival does so that people can practice against their shot sequences. It is nothing preposterous or special. And it goes on in other countries as well. The problem is that you need the resources to make it happen, and most countries don't even have the quality of players. In any case, I suspect that He Zhuojia is getting more opportunities in part because she is simulating Ito as a practice partner. Let's move on. Just saw this. Cheng Yinghua and Huang Tong "Jack" Sheng are two of my co-coaches at the Maryland Table Tennis Center (since 1992), and they, and many others, have explained China's long-time system of recruiting players to mimic their main rivals. Cheng was on the Chinese National Team from 1977-1987. During those early years China's main rival was Hungary, and so Cheng's primary role during that time was to mimic Tibor Klampar, while Jack's role (1976-1983) was to mimic Gabor Gergely. They had a third player whose job it was to copy Istvan Jonyer, but I don't recall his name. When Hungary began to decline and Sweden became their primary rival, Cheng was asked to mimic Jan-Ove Waldner, and became the Chinese team's practice partner to play Waldner. In both cases Cheng and coaches spent a huge amount of time watching films, studying Klampar and Waldner's games, with Cheng mimicking the serves and shots. When Jiang prepared to play at the Worlds before winning his two men's singles titles, much of his preparation was against Cheng and his Waldner game. If you watch Cheng play later on, you can see how he blended the strokes and serves of these two. When he wants to, he can copy either so closely it's spooky. Cheng told me a funny story that was verified by several other Chinese team members. Jiang Jialiang won men's singles at the 1985 Worlds. Before the 1987 Worlds, most people thought that Cheng would be selected for the team since he was beating most of the other Chinese team members, but the Chinese coaches were afraid that the Europeans would be used to his European-style game, and so didn't select him. So Cheng instead continued as their Waldner player, since it was now obvious Waldner was Jiang's main rival. The story is that over the last few months, at the end of each session, Jiang and Cheng would play a match, with the loser having to do push-ups. Cheng won nearly every time, and would then stand over Jiang, mocking him and saying, "How can you beat Waldner if you can't even beat me, a mere practice partner?" The truth was that Jiang's pips-out style, as he played it, was simply an inferior style of play compared to the European two-winged looping game, and once a player like Cheng got used to Jiang, he could beat him over and over. Jiang went on to win the Worlds over Waldner again, thanks to the training with Cheng (and Waldner's lack of practice against pips-out players), but it showed why the style would mostly die out. Around this time Sweden hired a Korean pips-out penholder as a full-time practice partner, and from then on Sweden was comfortable playing that style. China, of course, after a few years losing to the Europeans (early 1990s), developed their own two-winged loopers, perfected the style, and has dominated the world with it for many years. Cheng has done the same thing here in the U.S. To prepare Todd Sweeris for the 1996 and 2000 Olympic Trials (he made both), Cheng was able to uncannily mimic both Jim Butler and Khoa Nguyen in practice for Todd. They focused on Khoa, and though Todd had never gotten a *game* off him before, he beat him 3-0 at the 1996 Trials to make the team, and I think again in 2000. (I also helped develop the tactics for playing Khoa. Sorry Khoa!!! ) It's also a primary reason why Todd was able to upset Jim Butler in the semifinals of Men's Singles at the 1998 U.S. Nationals - he practiced with Cheng, who mimicked Butler. Cheng also sometimes mimicked David Zhuang, switching to a pips-out penhold racket and playing easily 2500+ that way. (Cheng actually started out as a penholder.) Jack has also done this, mimicking rival players for his students, such as Crystal Wang.